What is the Deliberative Society? 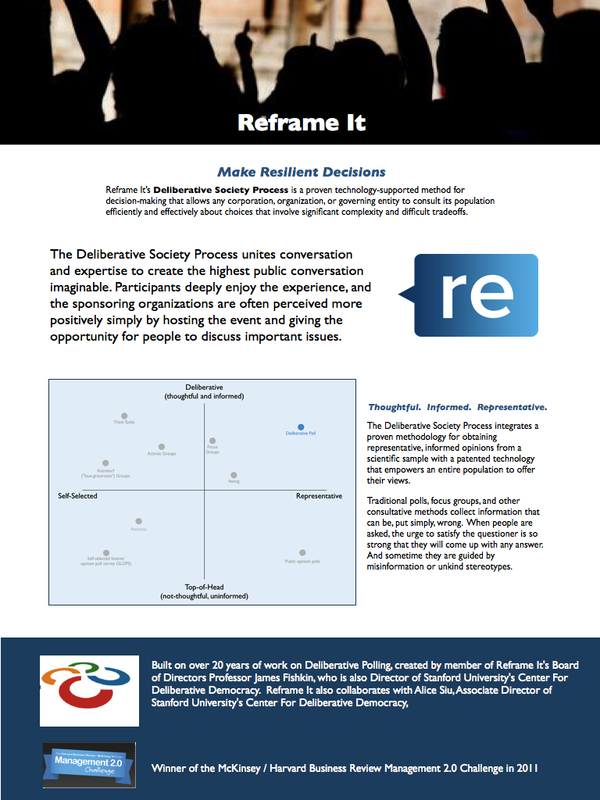 The Deliberative Society is a technology-supported process for sustainable decision-making. It allows any organization or governing group to consult its population. The process builds trust and knowledge so that the implementers can find out what the people would think if they were thinking. It builds political capital and informed consent so leaders can make the right decision even when this involves significant complexity and difficult tradeoffs. This process, which won the McKinsey/Harvard Business Review Management 2.0 Challenge in 2011, integrates a proven methodology for obtaining representative, informed opinions from a scientific sample with a patented technology that empowers an entire population to offer their views. We call this combination of techniques the Deliberative Society process. The Deliberative Society process combines one or more Deliberative Polls, online commentary, and additional mechanisms to ensure the validity of the online component, along with analytical techniques that merge the in-person and online events into a cohesive whole. 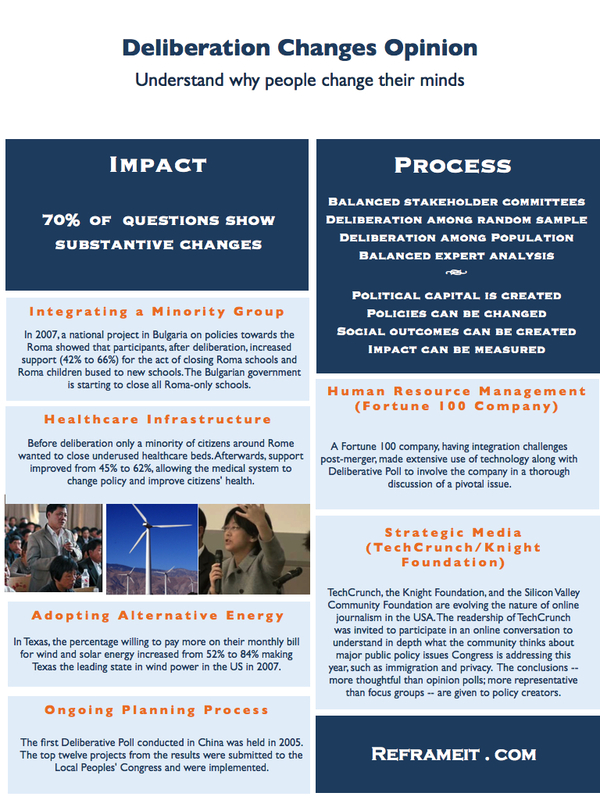 The recommended approach includes an initial Deliberative Poll, followed by online commentary in which revisions to the questions asked in the Deliberative Poll are refined and prioritized. There is then a second Deliberative Poll that is based on the results. This process can enhance decision-making for almost any group, including global multi-national companies — geographically dispersed and multi-lingual — as well as companies with more regionally concentrated workforces. It works even when there are deeply divided cultures, and challenges for which the group has not thought through the complexities before the process begins. Because considered judgments of populations are more likely to be sustained than top-of-the-head opinion, the process can create a deeper form of stakeholder buy-in. It allows resilient solutions to be identified, accepted and sustained over time. It can engage the collective intelligence of the workers or the clients of a corporation and provide decision makers with a data driven basis for choices that might otherwise be dominated by anecdotes and impressions. Interested in the thought process behind the Deliberative Society? Check out Citizen Voice in a Globalized World, a report co-written by Reframe It’s CEO and Co-Founder, Bobby Fishkin, with the Global Citizen Foundation, and released in edited form by the Center For Global Development.